While reorganizing a closet that contained boxes of things I hadn’t touched in years, I came across some of my grandmother’s personal effects and found a trinket box with the above sigil painted underneath, on the bottom of the box. It’s a feng shui talisman of some sort, that much I know. According to my mother and those who are in the know, it’s “a spell.” Their words, not mine. A blessing spell meant to guard and protect. The left-most column of text calls upon the guardians of the four cardinal directions, which in feng shui theory are the Red Phoenix in the South, the Black Tortoise in the North, the Blue Dragon in the East, and the White Tiger in the West. The right-most column of text calls upon the spirit guardians of the five relative directions, or Up, Down, Left, Right, and Center. The center column is about the founder of the Ba Gua, or eight trigrams, and calling upon that energetic legacy for protection. I might liken that to praying to a venerated saint and hoping that the saint will come and bail you out of trouble. Meanwhile the guardians of the four cardinal directions are about the universal, collective Qi energy while the guardians of the five relative directions are about the personal Qi, like a call for summoning up your own inner strength. 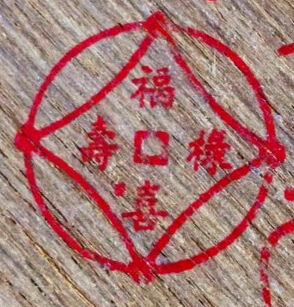 Then the characters inscribed in the circles with the little squares at the center are just various characters for good luck and fortune, like happiness, prosperity, yada yada. The square within the circle is symbolic of the harmony between heaven and earth. It’s basically a pictorial expression of “heaven is on my side.” The diamond thing forming the four points are representative of the four gates of…something. It’s a mandala thing. The chain of lemniscates or infinity symbols reinforce the intensity of power or the efficacy of the spell. It’s the insurance policy. I suppose it’s like adding a string of exclamation marks behind a statement to show you really mean what you’re saying!!!!!!!!!!!!!! Then you have the overall form or structure of the painted sigil, which is meant to represent a bell or wind chime, which is superstitiously believed to ward off evil spirits. Allegedly, evil spirits are afraid of the sound of bells, which is a pretty interesting belief if you consider the cross-cultural employ of bells in religious services. A less abracadabra way of phrasing it (though no more scientific) is to say that the sound of bells or wind chimes can scatter malignant energies or bad Qi. The discovery of this sigil among my grandmother’s personal effects coincides quite synchronously with recent personal research on sigil crafting. In certain Western esoteric traditions, a pictorial symbol is rendered from the letters of a sentence that expresses the sigil creator’s wish, will, or intent. Some then remove repeating letters from that sentence, and some will go on to also remove the vowels (they’ll disenvowel the sentence… ha.. ha.. sigh, sorry. corny humor. now you know I’m a nerd), but ultimately all will then take the distilled lot of letters and use them to draw a symbol. That symbol is a sigil, which is meant to help along that wish, will, or intent into manifestation. Basically, it’s a spell. Sigils are like mystical logos. They’re emblems made to recognize or acknowledge the identity of something, much like a logo, except what a sigil acknowledges isn’t a company, but rather an intent or wish. Anyone can design a logo and anyone can craft a sigil, though there will be the erilaz among us, the modern day equivalent to the Iron Age rune masters. I’ve heard that in the Western esoteric tradition, when a sigil is crafted from a language with an alphabet, you write out the sentence as an affirmation, knock out the repeat letters and heck, maybe throw out the vowels too while you’re at it (disenvowel! ), and then with the remaining letters, artistically style it into a symbol, which becomes the sigil. The sigil represents your specific intent, as expressed by the affirmation, and like a spell, through visualization psychology will help manifest that intent. That method may not work so well with a language like Chinese. 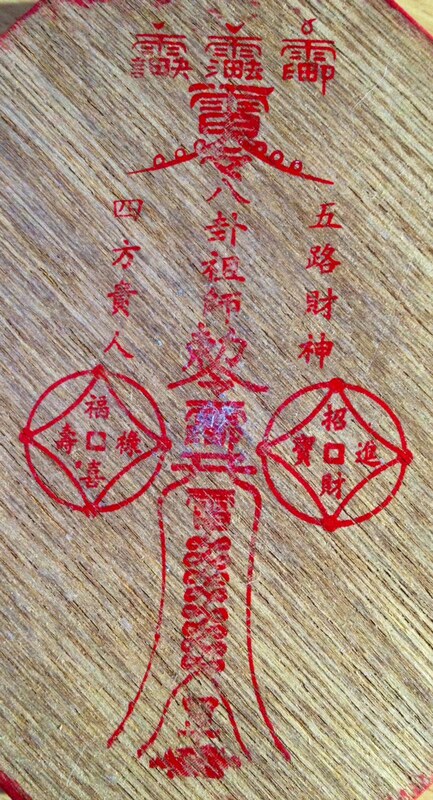 In Chinese, I use the Lo Shu square as a grid for drawing the sigil. The sentence is written out just as it is in the Western esoteric tradition, except for each character, the number of strokes is determined and take the theosophic reductions of those numbers, i.e., keep summing up the digits of the sum until you get a number 1 through 9. Each character in the sentence therefore corresponds to a number 1 through 9. Then plot those numbers in the order the corresponding characters appear in the sentence into the Lo Shu square. A pretty hideous looking sigil is thus formed. I just made up this so-called Chinese method, by the way. After reading about sigil crafting in the Western esoteric tradition, I wondered about how I might craft sigils from sentences written in Chinese and came up with that. As I said, it’s pretty hard to craft swanky sigils with that Lo Shu square grid. That’s probably why the Chinese go with the elaborate red sigil things. The Parable Sutra: Nihilist Twist on Noah’s Ark? Disenvowel! I love it! Sigils are an excellent method of magic. Chaos Magic made it quite well known. There are various methods of creating and launching sigils. The 90’s was all masturbation, death posture, and other somewhat questionable methods. I use methods of trance and visualization. I’m also one of those Runesters you mentioned, although far from a master. Bindrunes make for very powerful sigils. One should have a working knoweldge of the Runic system before slapping them together.